I picked up a Hammond M-3 that would not run. The start motor would get it up to speed but the run motor would not sustain the correct speed. I determined that the vibrato scanner needed cleaning and the tonewheel generator needed oil. I decided to pull the tonewheel generator to work on it and decided to take some photos while it was out. I've not seen too many photos of the insides of a tonewheel generator. I found the construction quite interesting including staggered shafts for each section and dummy tonewheels for balance. Every tonewheel generator that I have shows zinc whiskers throughout. 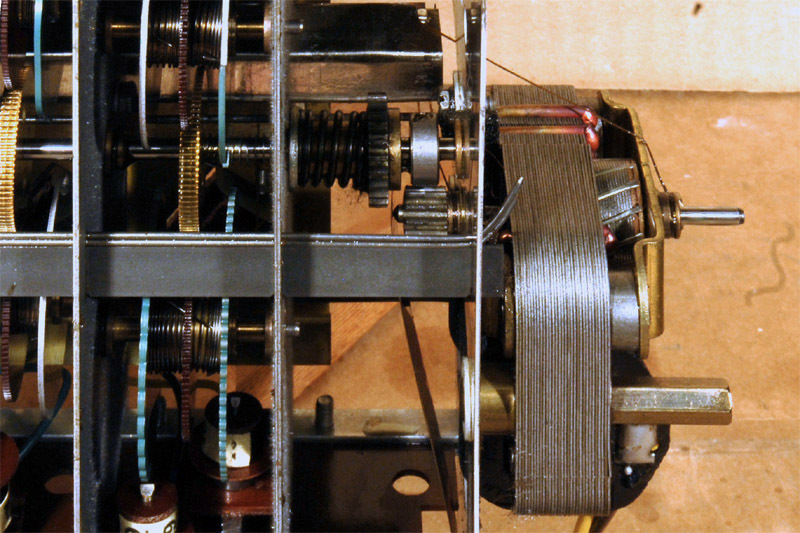 Here's a closeup whitch shows a dummy tonewheel (third from the left). The zinc whiskers are quite evident in this photo. 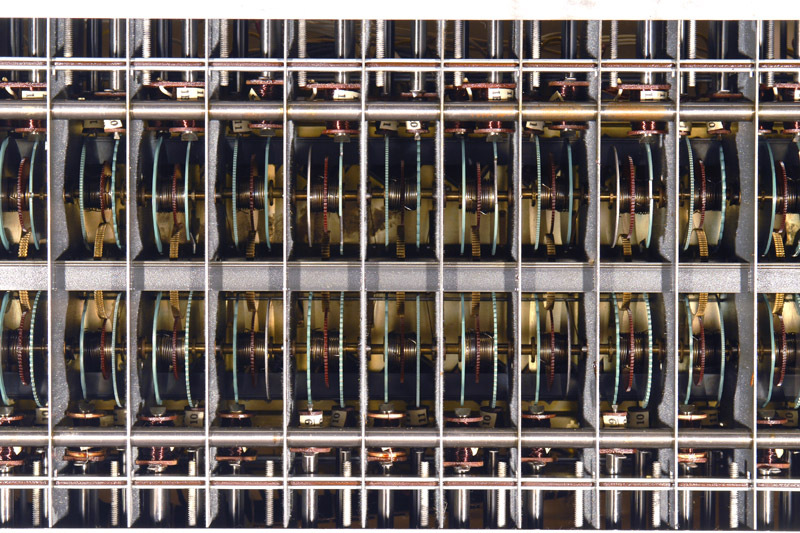 I was surprised to see rectangular notches in the low frequency tonewheels. 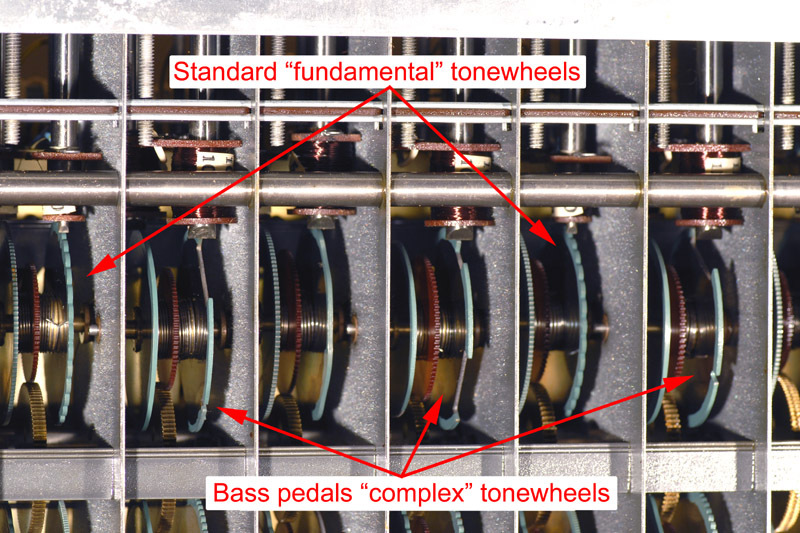 These are the complex tonewheels which generate complex waveforms for the bass pedals. This photo shows the standard tonewheels and the complex tonewheels with the different size rectangular notches. The tonewheels with the sharp notches are the "complex" tonewheels for the bass pedal notes. The notches give an output from these wheels rich in harmonics, the tonewheels for the manuals produce simpler tones containing just the fundamental and very little in the way of harmonics. Complex tones on the manuals are built up by using the different harmonic drawbars. The bass pedals start as a complex tone which is filtered to produce a mellower tone but still with some character, just how mellow the tone is can be controlled by the "Pedal Mute" tab. The service manuals for the L and M series organs mention the complex tones for the bass, but don't go into detail. The original console models had sine wave wheels all the way down to the lowest frequency, and no bass foldback on the 16' manual drawbars. At some point, Hammond engineers decided that complex tones for the first 12 wheels used only on the pedals and bass foldback on the manuals sounded better. 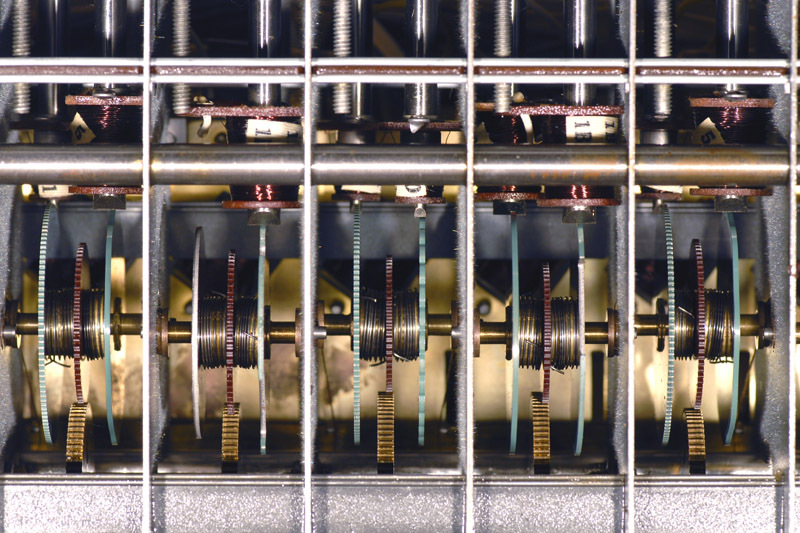 When the first M-series organ were built, it was natural to use the same complex tones for the spinet bass pedals. This is the waveform for the bass pedal G# (fourth tonewheel on the left in the above photo). 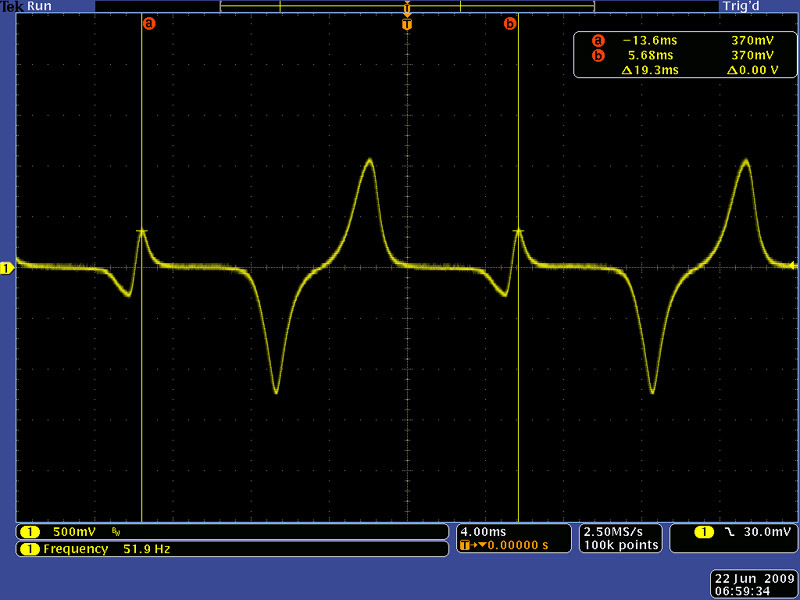 It shows the complex waveform generated by the different size notches. 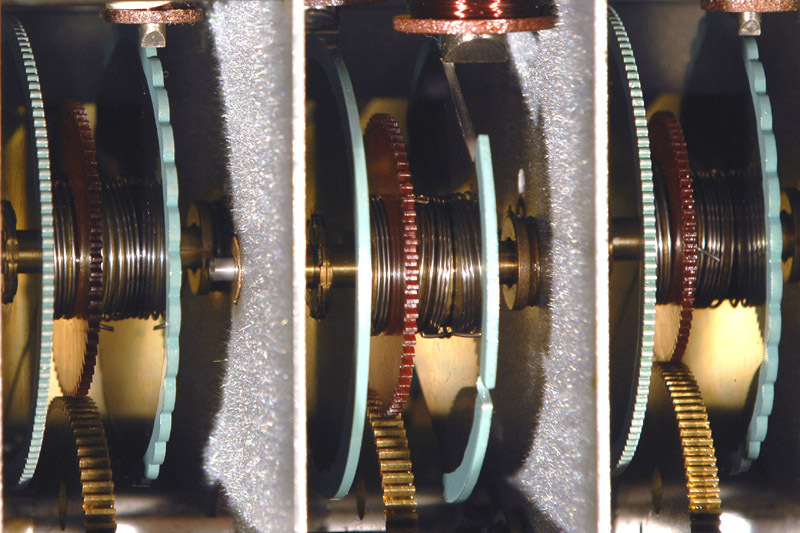 This photo shows the starting motor gear arrangement. Note the oiling threads going to the bearings on both sides of the motor. This photo shows the tonewheel clutch, shaft and bushing detail as well as the zinc whisker growth. 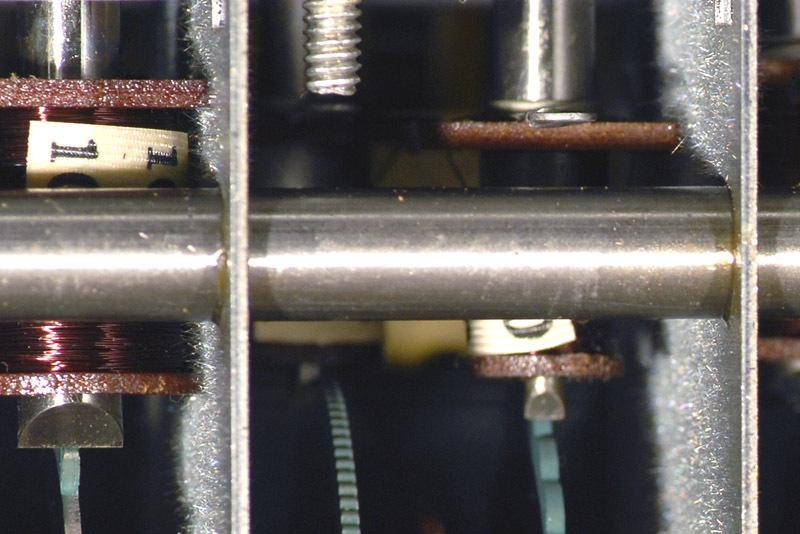 This photo shows a closeup of two different size pickup coils. There are a variety of different size pickups in the tonewheel generator.